Face painting at Thistle & Bess. FREE face painting by Claudia from 5-7. She’ll help you to get you in the festive spirit for FoolMoon, and will even be bringing some glow in the dark paint – plan on taking some selfies! FAST Foolish Fashion at Found! Stop by Found before the Luminary Procession to the FoolMoon festivities downtown to make a fast fashion recycled plastic skirt or hat, a 2o minute tutu, or other fast foolish fashion, starting at 5:00. 5-6:30. Pre-Glow Apothecary Adornation, at Jessica’s Skin & Body Apothecary. Step into your evening of FoolMoon festivities with some sparkle and aromatic adornment. Jessica will be serving some free sparkling drinks as you dust yourself with 24 karat gold powder and choose a natural fragrance to anoint yourself with. Make paper flowers at Fustini’s Oils & Vinegar, upstairs in the Kerrytown Market & Shops. You’ll step into the foolishness in style with a colorful paper flower bopping around on a headband or as a classy boutonniere. Great for FoolMoon on Friday AND FestiFools on Sunday afternoon! Wine & Salmon at everyday wines! Sample three wines and for a mere $5, you’ll will also enjoy smoked salmon from Durham's Tracklements and Smokery to pair with the wines. 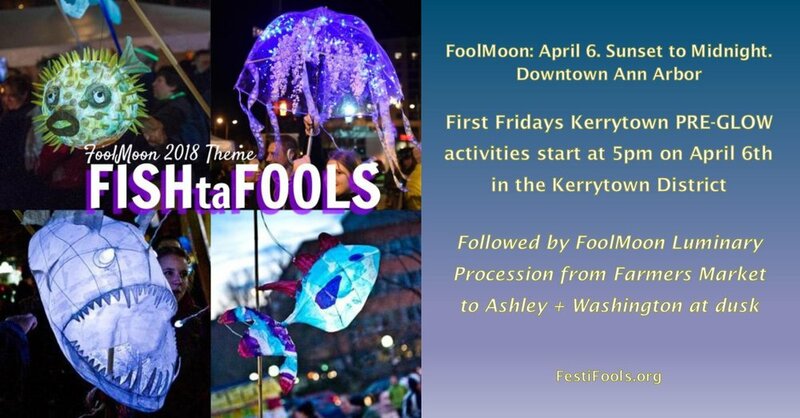 We're a great starting point to kickoff First Friday, the FoolMoon luminary procession (begins 7:45 pm in Kerrytown Farmer's Market) and FISHtaFools - the theme for this year's Festifools. No advance tickets necessary but show up early if you want to do the Fishtafools smoked salmon pairing. 6-7pm. Play the Kerrytown Bells! YOU can make music by playing the massive keyboard that controls the tower chimes.Upstairs by the main entrance of Kerrytown Market & Shops. All skill levels (and no skill level) welcome. Marcia will be there to help you make WonderFool music during FoolMoon PreGlow event! 16 Hands of Kerrytown "upstairs" is hosting a student art display featuring Ann Arbor Public Schools International Baccalaureate art program, with two and three dimensional pieces from all grade levels. Look for Happy Hour Specials, free glow stick bracelets, crazy costumes, luminaries and more surprises during #FoolMoonPreGlow in the Kerrytown District!